01/06/1996: 99-90-94 = 283 points. 1998: 96-86-96 = 278 points. 1995: 98-75-93 = 266 points. Nero von der Weyermühle passed the Erstkörung at two years of age with Körklasse 2B rating in 1995. His sire, Hertog Conan van Manensheide, was the winner of the D.V. Meisterschaft in 1993 plus winner of numerous show titles and passed the Körung 'for life' with highest rating for hardness and working drives. Hertog Conan lived to 7 years of age with the cause of death being Bloat and Nero's dam, Gina von der Weyermühle, passed away at 8½ years of age from cancer. 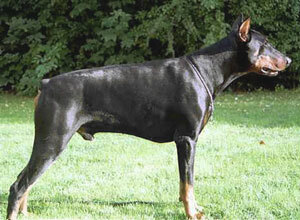 Ikarus: SchH 3, IDC-WM participant and sire of the vom Tschirgantblick “O” litter.